Who says you need a pool to have fun! 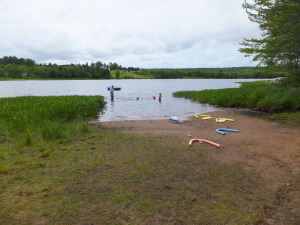 Enjoy the beauty and warmth lake water can provide, and sign up for swimming lessons every summer for a two week session at one of our local lakes (Lake Darling). Offered by the New Ross Family Resource Centre, this program is run through the Red Cross Swim Program, with a registered Red Cross swim instructor offering all levels. Pre-registration required, call (902) 689-2414 for more information.